This is the third in a series of festive mocktail recipes, created especially for you! You can see our recipe for a Grapefruit and Rosemary Mocktail, and our Ginger, Basil and Grapefruit Spritzer, here! 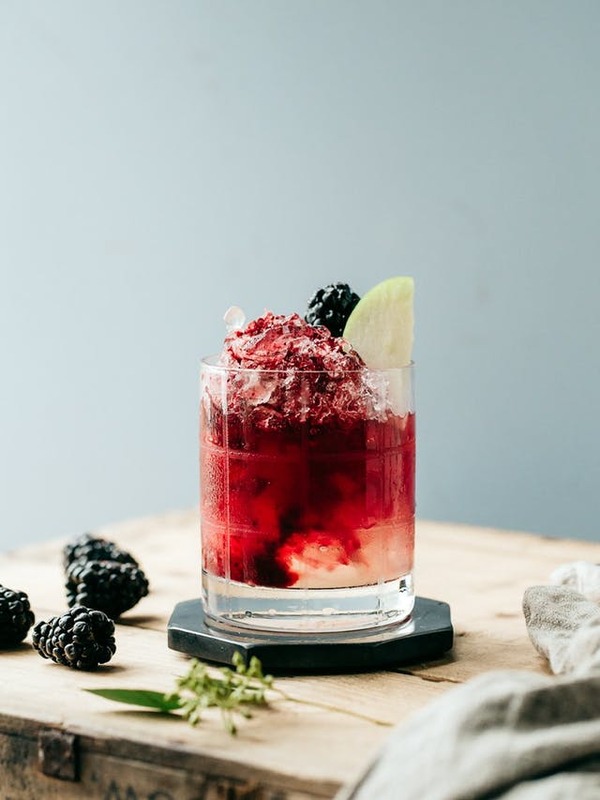 While a classic bramble calls for gin and blackberry liqueur, this mocktail incorporates juniper berries and frozen blackberries to create a similar effect. With a homemade lemon-rosemary juice that’s beautifully layered beneath the juniper-blackberry mixture, this mocktail is almost too pretty to drink. 1. Place 4 glasses in the freezer. Leave them there to frost. 2. Put the frozen blackberries, juniper berries, and sugar in a pot with a tiny splash of water and bring it to a simmer. Smash the fruit with a whisk until it breaks down. Simmer for 15 minutes, then remove from the heat. Cool down for a couple minutes and place in a blender on high speed until pureed and smooth. Strain through a fine mesh and place strained content in the fridge to cool down. 3. Rinse your blender and add the lemon juice and small rosemary sprig and blend for 20 seconds. Strain juice into a clean cup and set aside. 4. Place the ice in the blender and break it down in batches. Just pulse it a few times; you want it to be chunky. 5. Take the frosted glasses out of the freezer, fill half way through with crushed ice, then pour equal amounts of the lemon/rosemary mix into each glass, add a splash of sparkling water and top each glass with ice all the way to the top. Finally pour about 3oz (2 shots) of the juniper and blackberry reduction in each glass. Garnish with apple slices and a blackberry and serve. of the blackberry mix into the drink.